Beyond the Sun, Moon and planets lie the stars of our Galaxy. Some are grouped together in clusters, others are spread out along the plane of the Galaxy along its spiral arms, a region rich in nebulae (vast clouds of gas and dust). Far beyond our Galaxy we encounter other galaxies, clusters of galaxies and quasars. These objects – galaxies, star clusters and nebulae – are what deep-sky observers study. Galaxies, the largest assemblages in the Universe, take on a wide variety of forms. Based on their structure, they can be categorized as spiral, elliptical, or irregular. Spiral galaxies are probably the most familiar; they are flat discs with a bright central bulge from which the arms unwind. Spirals contain large amounts of gas and dust, with both young and old stars. Seen through all but the largest amateur telescopes, spirals appear circular if they are oriented face-on. At least a 30-cm telescope is needed to begin showing spiral structure. If the galaxy is oriented edge-on, it appears cigar-shaped, sometimes with a dark dust lane bisecting it. The brightest spiral seen from Earth is the Andromeda Galaxy (Messier 31), and even though it never rises very high as seen from southern Africa, it is still an easy naked-eye object from a dark-sky site. The brightest southern spiral is NGC 253 in Sculptor. Barred spirals are similar to spirals, except that their arms curve away from a bar-like feature extending through the galactic centre. A prominent southern barred spiral is NGC 1365 in Fornax. Elliptical galaxies range from spherical to rugby ball shaped, and have no arms. Unlike spirals, they are composed of only old stars, with little interstellar matter. Through a telescope, ellipticals appear round to spindle-shaped. Messier 87 in Virgo is a good example of a bright elliptical galaxy. Irregular galaxies have no particular shape: the Small Magellanic Cloud is an example. They contain mostly young stars, with much interstellar matter. The dwarf galaxies are much smaller than the others and are particularly difficult to see. Our Galaxy is classified as a spiral. From our vantage point on Earth, we see it edge-on as a dim band of hazy light stretching across the sky (the Milky Way). This luminous band circling the sky, irregular in outline and fragmented in places by dark “holes”, is the arms of our galaxy. It appears fainter where it passes through Orion, and is at its brightest in Sagittarius. It is here, on the border with Scorpius, that the central bulge can be seen in the winter sky as a large bright patch in the Milky Way. Several of the small bright “knots” along the Milky Way are bright nebulae, large clouds of mainly hydrogen flooded with ultraviolet radiation from nearby hot stars, causing them to glow like neon signs. These emission nebulae may contain stars in the process of forming, or stars that have just recently formed. Other bright clouds are reflection nebulae, which are lit by cooler stars and reflect light towards us. Two other classes – planetary nebulae and supernova remnants – are associated with old stars. Planetary nebulae are roughly spherical shells of glowing gas, thrown off from a star that has undergone an outburst. Sometimes this central star that illuminates the gas can be seen. Supernovae remnants are similar, except that they are the products of immensely violent explosions of massive stars. The dark “holes” that break up the Milky Way are not areas lacking in stars, but are simply nebulae that are not lit by starlight. These dark nebulae are usually seen as silhouettes against a brighter background. The Coal Sack in Crux is a famous example. 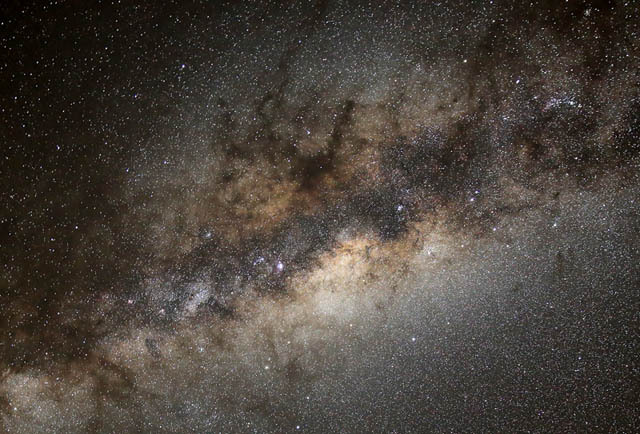 Other bright patches seen along the Milky Way are star clusters. Open clusters are irregular groupings of a few dozen to several thousand stars, are amongst the youngest objects in the Galaxy, and lie mainly in the spiral arms. Several can be seen with the naked eye as consisting of individual stars while others appear simply as brighter portions of the Milky Way. Binoculars resolve many open clusters into their component stars. The famous Jewel Box cluster in Crux can be seen with the naked eye as a bright spot of light, while a small telescope shows its stars, several having subtle colours. Globular clusters are considerably larger – hundred of thousands of stars held together by their mutual gravity – and older than open clusters. Found mainly in the galactic halo, centred around the bulge, they are most numerous in Sagittarius, Scorpius and Ophiuchus. The brightest globular cluster, readily visible to the naked eye, is Omega Centauri, not far from Crux. Members are invited to submit observations of deep-sky objects to the ASSA Deep-Sky Observing Section. Observers may qualify to receive an observing certificate upon completion of various observing programmes. Observations are publically archived and shared on the internet at the “Deep-Sky Observer’s Companion Database” website. Many resources for beginners and those at intermediate level are available from the Section, including the Southern Star Wheel planisphere, several star charts (e.g. ConCards and the Discover! constellation workbook), an Observing Checklist, and the comprehensive Deepsky Observer’s Companion tutorial. Get started by observing the Big 5 of the African Sky, five outstanding specimens of each class of astronomical object in prime position in the southern skies. The ASSA Top-100 Deep-Sky Objects catalogue offers a hand-picked selection of the most awesome deep-sky gems in the southern skies. Other catalogues of special interest to southern-hemisphere observers include those by Lacaille and Jack Bennett.